This year I wanted to have a lighted Christmas wreath on my fireplace mantel. I happened to have a pre-lit artificial wreath that would do the trick but it looked way to plain when the lights were off. So, I hauled that baby to my craft room and after a quick stop to Joann’s, I made some quick and easy additions that made the wreath worthy of all day display. I positioned where I wanted the bird’s nest to be. I then covered the stick that it was attached to, with E600o craft glue, and inserted it into the wreath. The two leafy floral picks and several stems of leaves in one pick. From one of the bundles, I cut three individual stems with a tin snip. The wire was very heavy so it took a little be of work. I covered the ends of each of these stems with glue and then inserted them into the wreath around the bird nest area. 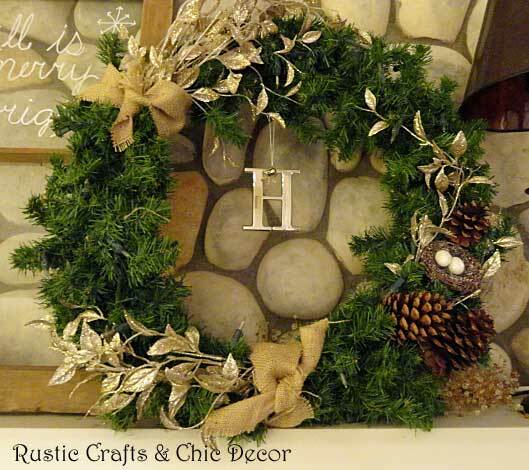 For more bulk on that right side of the wreath, I also added three pine cones by simply hot gluing them in place. The smaller bundle of gold leaves, which had some stems cut off, I inserted at the bottom of the wreath with E6000 glue and the other bundle was inserted at the top of the wreath. Since I love burlap, I tied a strip around the ends of each leaf bundle. Finally, I hung the monogram ornament from the center of the wreath! 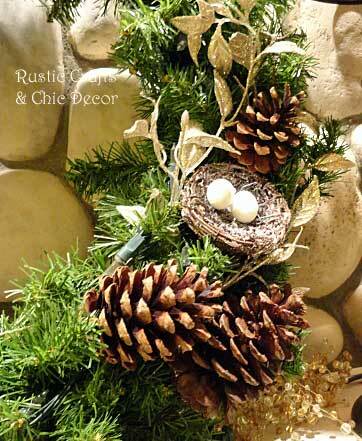 I like a natural rustic style but anything can look festive with glittery gold or white sparkle! 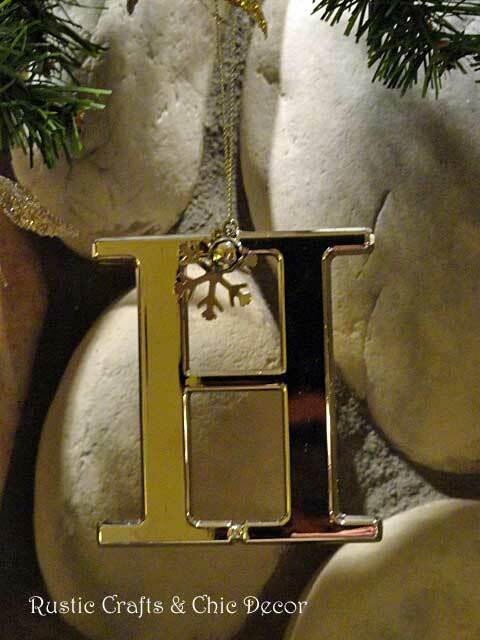 When I saw these monogram Christmas ornaments, I knew that I would have to incorporate one into my wreath somehow! Simply hanging it from the center is super easy.